Pack Size: 35 Gm., 105 Gm, & 210 Gm. We are one of the renowned firms for providing a broad collection of Advanced Energy & Hydrations Drink. In order to cater the variegated demands of our precious clients, we have come up with a quality assured Lemon Flavor Energy Drink. Offered drink is well processed using rich grade lemon and modern processing techniques. The provided drink is highly appreciated by our clients for its high effectiveness and safe consumption. We are able to manufacture a comprehensive range of Instant Energy Booster Drink. 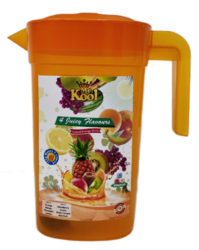 To cater variegated demands of our esteemed clients, we are highly engrossed in manufacturing and supplying a wide range of Flavored Energy Booster. Technical Specification: Dextrose 17.5 gm. + Sucrose 14 gm. + Zinc Sulphate 32.5 mg. + Ascorbic Acid 50 mg.
We are a reputed entity in the industry, actively engaged in offering an optimum quality range of Vinner Z Instant Energy Drink Powder.